III IN THE EYES OF FIRE/Ltd.Ed. III IN THE EYES OF FIRE/Ltd.Ed. : III IN THE EYES OF FIRE/Ltd.Ed. 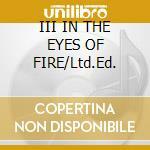 Titolo: III IN THE EYES OF FIRE/Ltd.Ed.